Cologne (Germany) (AFP) - German Chancellor Angela Merkel backed stricter laws to expel convicted refugees, as clashes erupted at far-right protests in Cologne over a rash of sexual assaults blamed on asylum seekers. Cologne police said they have now recorded 379 cases of New Year's Eve violence -- ranging from groping to theft to two reported rapes -- with asylum seekers and illegal migrants making up the majority of suspects. 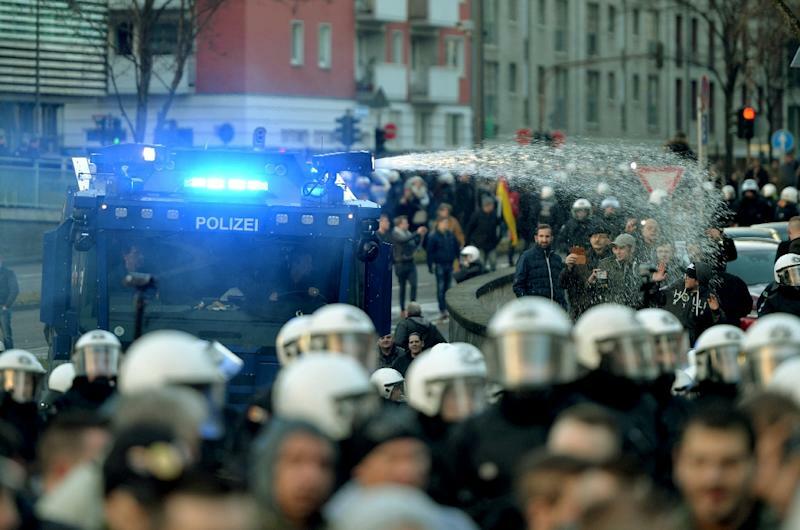 With anger growing at the scale of the attacks, supporters of the xenophobic PEGIDA movement marched in protests that briefly turned violent in the western city. Police used tear gas and water cannon to clear the rally of far-right supporters after protesters flung firecrackers and bottles at officers they said had failed to prevent the New Year's attacks on women. Vowing tough action, Merkel declared that any refugee handed a jail term -- even if it was a suspended sentence -- should be kicked out of the country. "If the law does not suffice, then the law must be changed," she said, pledging action to protect not just German citizens, but innocent refugees too. Witnesses described terrifying scenes of hundreds of women running a gauntlet of groping hands, lewd insults and robberies in the mob violence. Of the cases reported so far, 40 percent related to sexual violence, Cologne police said in a statement. "Those in focus of criminal police investigations are mostly people from North African countries. The majority of them are asylum seekers and people who are in Germany illegally," police added, confirming witness accounts. The allegations have stoked criticism of Merkel's liberal open-door policy -- which brought 1.1 million new asylum seekers to Germany last year. As questions grew over the country's ability to integrate the newcomers, it emerged late Saturday that a man who was killed trying to attack a police station in Paris on Thursday had lived in an asylum seeker shelter in Germany. Revealing that they had raided the man's apartment, German police did not specify if he was an asylum seeker, but a source close to the matter told AFP that the man was indeed registered as one. In Tunisia, a woman who claimed to be the man's mother confirmed that he had been living in Germany but denied he had any links to extremist groups. 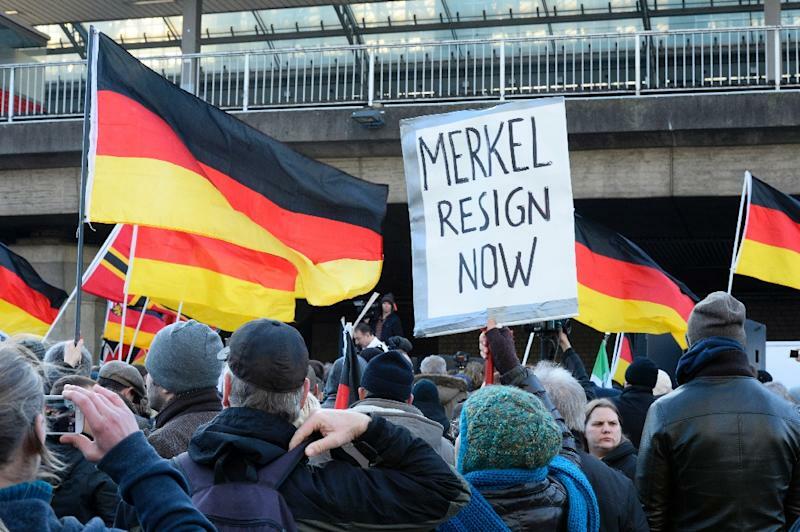 In Cologne, hundreds of PEGIDA supporters waved German flags and signs saying "Rapefugees not welcome", as they shouted "Merkel raus" (Merkel out). The rattle of a helicopter circling in the skies and the occasional bang of a firecracker added to tensions as counter-protesters, separated from the PEGIDA crowd by police, chanted "Nazis raus". The populist right-wing Alternative for Germany party, which polls show as having 10 percent support ahead of state elections this year, claimed the violence gave a "taste of the looming collapse of culture and civilisation". Playing on popular fears about Europe's migrant influx, the mob violence threatens to cloud what had been a broadly welcoming mood in Germany where crowds cheered as Syrian refugees arrived by train in September. "Cologne has changed everything, people now are doubting," said Volker Bouffier, vice president of Merkel's CDU party. Details remain hazy of what happened in the frenzied crush on what was supposed to be a night of New Year's celebration. It was unclear how many of the suspects had been in Germany long-term or belonged to a scene of drug dealers and pickpockets known to lurk around the railway station, and how many were newly-arrived asylum seekers. On Friday, the interior ministry said Germany's federal police had identified 32 suspects, 22 of whom were asylum seekers, in connection with 76 offences, 12 of which had a sexual nature. Merkel has so far refused to abandon her welcoming stance towards war refugees but on Saturday had tough words for law breakers. "If a refugee flouts the rules, then there must be consequences, that means that they can lose their residence right here regardless of whether they have a suspended sentence or a prison sentence," she said after a meeting with the top ranks of her party in the southwestern city of Mainz. Under current laws, asylum seekers are only deported if they have been sentenced to jail terms of at least three years, and if their lives are not at risk in their countries of origin.